The Village of North Prairie Police Department is providing a DRUG TAKE BACK DAY on April 27, 2019 from 10:00 am until 2:00 pm at the Village Hall, 130 N Harrison Street in North Prairie. Click on this link for more information! The Village of North Prairie Volunteers will be holding a Spaghetti Dinner Fundraiser for the North Prairie Fire Department Auxiliary to purchase a vehicle to assist the firefighters and neighboring communities on fire calls on Saturday, May 11, 2019 from 5:30 pm until 8:30 pm at the Village of North Prairie Municipal Center, 130 N Harrison Street, North Prairie. Open Book for the Village of North Prairie with the Assessor is scheduled on Monday, April 29th, at the Village Hall from 11:00 am until 1:00 pm. Board of Review for the Village is scheduled on Monday, May 13, 2019 at 6:00 p.m. Click on the link for more information. Beginning January 1st, 2019, John's Disposal Service will be changing the way bulky items will be collected each month. Effective January, 2019, residents are required to call John's Disposal at 888-473-4701 and schedule each bulk collection. Each residence will still receive up to one bulk items collection per month, however, residents must call at least 72 hours in advance of their desired pick-up date and options will be made available by office staff. It is the Village's responsibility to control/reduce the use of salt on the Village streets. We need your cooperation to drive at slower speeds during the winter months to ensure the safety of yourself and Village residents. A link is provided in the contact information to Waukesha County's website for additional information regarding the effects of using salt on Village streets. 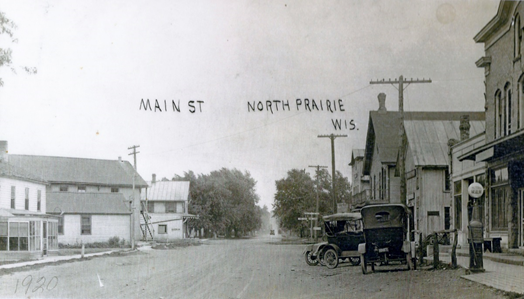 2019 is the year North Prairie is celebrating the 100th anniversary of its incorporation! The photograph was taken in 1920 and is looking south on North Main Street. The hill in the middle of the photo in the background is the hill leading up to Prairie View School. Our community began in 1836 when Thomas Sugden, who was working on his land near Eagleville, took a walk to the top of the hill near Prairieville Elementary School and overlooked a beautiful "Prairie" "North" of his home. Later that year, Thomas returned with two other early pioneers, Mr. William Coats and Mr. William C. Garton. They were soon followed by Charles Ranous (often spelled Raynous) arriving in 1837 who built the first blacksmith shop and the first home in North Prairie. Originally what was to become North Prairie was known as Brown's Corners located at the intersection of Highways E and ZZ. A stagecoach stop was located there on the NE corner of the intersection. The area population was stagnant until the arrival of the railroad in 1852. With the railroad coming through the area south of Brown's Corners, North Prairie Station became the hub of activity. Please walk your pets safely at night. Wear illuminated protective clothing and lights so that drivers are able to see you and your dogs. NORTH PRAIRIE CEMETERY ASSOCIATON- If interested in contacting a representative regarding the North Prairie Cemetery, please contact the Village of North Prairie Clerk's Office at 262-392-2271. Click on above link for additional information. Click on above link for the application and additional information. Election Inspectors - The Village of North Prairie is looking for pollworkers to assist with elections at the Village Hall. This is a paid position with training required. If interested, please contact the Village Clerk at 262-392-2271. Open burning requires a burning permit. Permits must be obtained through the Village Office, as a signature is required (must be at least 18 years old). An Annual Permit (calendar year) is issued for $15.00 OR a two-week permit for $5.00. Call 262/392-2271 for more information. Have a question, comment, or criticism? Have a complaint that needs to be investigated? Use our Complaint Form.